The frog will remain in captivity where it’ll be provided with specialist care. 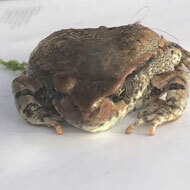 Travellers are being urged to check their luggage for stowaway creatures before going home after a frog flew more than 8,000 miles from South Africa to Nottinghamshire. The warning comes from the RSPCA after animal collection officer Paula Jones was called out to the village of Darlton. A woman had returned from a holiday in South Africa and found the frog, which was about the size of a £2 coin, in her suitcase. “The caller was unpacking from a recent trip abroad when a little frog hopped out of her bag,” ACO Jones said. “She managed to quickly confine the amphibian under an upturned box and contacted us for help. The RSPCA is frequently contacted by holidaymakers who have returned home with something they didn’t quite expect. ACO Jones added: “We often get called out to collect lizards, frogs, crabs and spiders who have crawled into clothes and bags before flying home with their unsuspecting smugglers. We’ve even been called by people who have found potentially deadly scorpions in their suitcases!